February 19, 2018, 2:20 PM · In an effort to promote the coverage of live violin performance, Violinist.com each week presents links to reviews of notable concerts and recitals around the world. 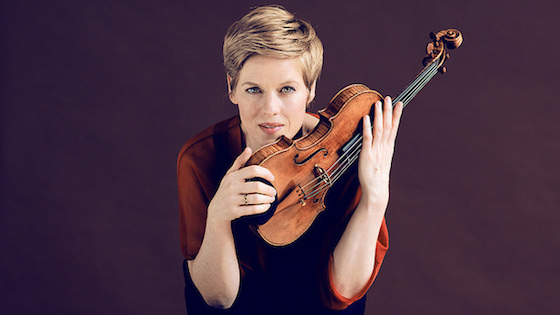 Isabelle Faust performed the Mendelssohn with the Cleveland Orchestra. The Plain Dealer: "The violinist...evinced a marvelous range of dynamics, a poet's sense of phrasing, and a degree of sheer technical virtuosity that would have dropped jaws in any context." Isabelle Faust. Photo by Felix Broede. Vilde Frang performed the Beethoven with the Los Angeles Philharmonic. Los Angeles Times: "Frang is a serpentine Beethovenian. There is an ethereal aspect to both her appearance and her playing that extends even to the way she holds her instrument — dangling the violin by the scroll as though it were an extension of her fingers. She floated through the concerto, eschewing drama and heroism. Her tone was often delicate but never fragile, as she demonstrated in the Fritz Kreisler first movement and the soulful Larghetto, showing she could apply as much sonic pressure as she liked. But mainly, she liked to remain mysteriously allusive." Joshua Bell performed Wieniawski's Violin Concerto No. 2 with the Philadelphia Orchestra. The Philadelphia Inquirer: "...he was entirely emotionally present at every turn on Thursday." Ruggero Allifranchini performed the Vivaldi with the St. Paul Chamber Orchestra. Minneapolis Star Tribune: "...his solo work in Vivaldi’s 'Il favorito' Violin Concerto was a gem of rediscovery and reinvention." Yi-Jia Susanne Hou performed the Mendelssohn with the Lansing Symphony. City Pulse: "Guest violinist Yi-Jia Susanne Hou played with a tone that was so ductile, so tender, so free of friction, it made the downiest peach fuzz seem like the unshaven chin of Popeye." Sergey Khachatryan performed the Beethoven with the Ulster Orchestra. Belfast Telegraph: "Sergey Khachatryan had an almost self-effacing approach during which he allowed the rare beauty of the music to speak for itself." The News-Gazette"That Bell is a great violinist is not news, but it is the greatest of pleasures to hear him confirm it." Joshua Brown performed Vivaldi's "Four Seasons" with the Champaign-Urbana Symphony. The News-Gazette: "Brown is clearly a young performer of considerable promise. His sparkling playing in the Vivaldi 'Four Seasons' Concertos, along with fine ensemble work by members of the C-U Symphony, ably led at the harpsichord by Stephen Alltop, gave renewed joy to this often heard composition. As encore, Brown played with dazzling bravura the most famous of Niccolò Paganini's Études, No. 24 in A Minor, on which so many famous composers have written variations." February 20, 2018 at 01:24 AM · I didn't know the Beethoven Concerto had a "Fritz Kreisler first movement." February 20, 2018 at 07:58 PM · She was doing the Kreisler cadenza, lol. February 24, 2018 at 01:23 AM · I envy the audience in Cleveland who got to hear Isabelle Faust. From her recordings and YouTube performances, I place her among the very best violin soloists going. I did get to hear James Ehnes, with Kent Nagano, perform the Beethoven concerto today via live feed from the Gothenburg Symphony. I predict he'll get great reviews from the Swedish media; meantime, he's got one from me.